Dental Technician Diploma program at IIK contribute directly in improving human resources and teaches techniques in making artificial teeth professionally, as well as the rehabilitation process which precisely and accurately in accordance with procedures and regulations. Studying dental techinician at IIK gives a generous amount of valuable insight and experience. 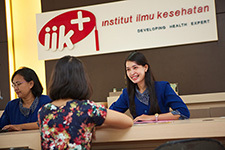 The facilities provided at IIK is one of the many ways used to sharpen students’ ability to carry out the dental profession.